Even though I don't do any crafting, I love this craft room. It belongs to Danny Seo, eco-homes expert. 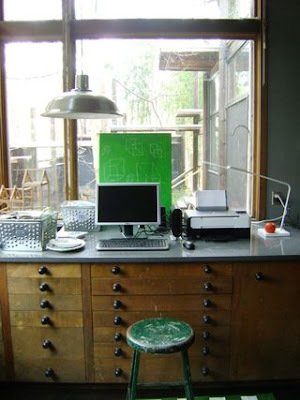 The cabinet, the light, the distressed green stool - they all work really well in this space. 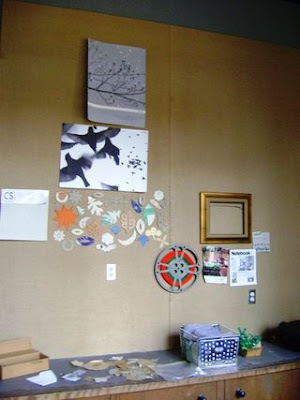 The walls are covered in homasote board, covered with burlap. Don't they look fantastic? It is one of my aims in life to have an inspiration/mood board, and these are a perfect backdrop. And isn't this a great idea? 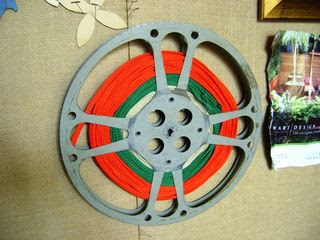 It's an old movie reel, now used for storing ribbon. Yes - it looks great! Great post. Thank you so much for your nice comment on my blog! It is always such a pleasure to find new interesting blogs - like yours! YOu are awesome! Now I know what to do in my art space. The studio wall went up yesterday and the stairs in our home are nearly finished and I get to create a little corner of the studio as mine and love the wall idea! This will be a long project(bc it all costs $$$) but will remember this post! Thanks. 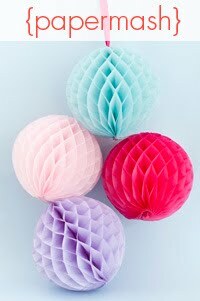 I feel certain that if I had a proper craft room that all sorts of crafts would miraculously appear. Until this time, I will continue to buy craft books and abandon projects a third of the way through. One cannot be expected to craft without a proper crafting room. I like this little room! I do volunteer work with CASA (court appointed special advocate for abuse and neglected children) so I know how heavy my heart can get on some of my visits. I'm sure working with the homeless can be difficult at times especially when the weather is not good to send them out in it. Thank you for visiting my blog a couple of days ago. It lead me to your wonderful blog! !